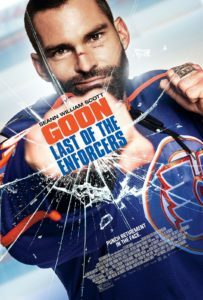 A Jay Baruchel film, Goon: Last of the Enforcers brings back the all–star cast that made the original so funny. Seann William Scott (American Pie) stars as Doug Glatt, along with Alison Pill (The Newsroom), Wyatt Russell (Everybody Wants Some), Jason Jones (The Detour), and with Elisha Cuthbert (24), Kim Coates (Sons of Anarchy) and Liev Schreiber. SEE IT ON SEPTEMBER 1st!